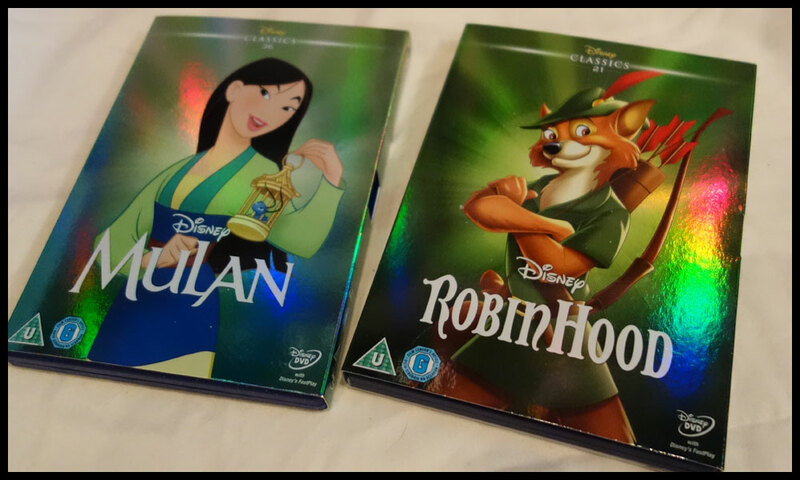 Two of my favourite Disney movies when I was little were Mulan and Robin Hood so when I got some Amazon vouchers for Christmas I decided to get them, these are the 21st and 36th in the series of ‘Disney animated classics’ with the limited edition slip cases over the covers. I’ve loved the look of these classic collection DVDs since I first saw them and as these two were a good price I thought they would be a good start to the collection if I get the rest. They do seem to range a lot in price, even in the 3 or 4 minutes I was on Amazon Mulan came down by over £2 and Robin Hood by about 50p so it might be worth keeping an eye out for the changing prices if you want any of the limited edition collection. I’m not really going to review the movies themselves so much, it’s more the specific edition of the DVDs. These are also available in Blu-ray and in some instances these are cheaper, at one time the Robin Hood DVD was £20 and the Blu-ray £13, I chose the DVD version as I don’t have a Blu-ray easily accessible and like to be able to watch things on my laptop as well. I’ll start with Mulan, the later of the two movies, it was released in 1998 when I was 9 so around the time when I got really into Disney. Maybe that’s one of the reasons I really liked it, I always liked the characters of Mushu and Cri-kee as well as Mulan herself, I think all of the characters in this are good actually. It kind of follows the girl meets boy, they fall in love, get married and live happily ever after formula of Disney but it seems to have more depth and Mulan especially is not the typical female Disney character to me. The card slip cover has the holographic effect that all of these limited edition ones have and is in a slightly bluey green. 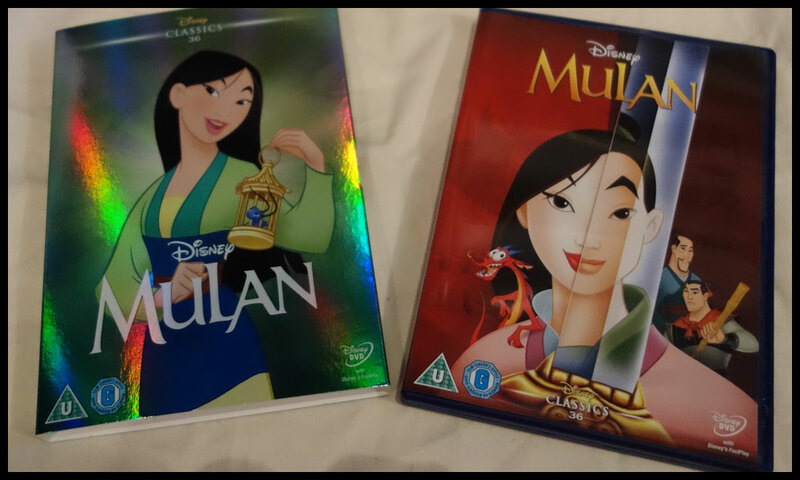 The main picture on the front of this is different to the front of the actual DVD case cover and is Mulan in her original clothes and long hair at the beginning of the story holding Cri-kee in his cage. I really like this design and the simple design ties in with the rest of the series as they all have the holographic back with different colours and the main character on the front. The inner case has both the image of Mulan in her ‘dressed up’ look from near the beginning of the movie and the image of her as a soldier in the sword. I think this was a good way to tie the two images together and shows the contrasts in the two lifestyles. There are also the two characters of her father and Shang in the background with Mushu, her other friend throughout the movie, leaning on her shoulder. I do like this case but definitely prefer the other one. I’m not sure why they chose to use a green colour in the holographic one when this has a red background. I think using this image on the front with a red holographic background may have kept it truer to the original movie poster and video/DVD releases. 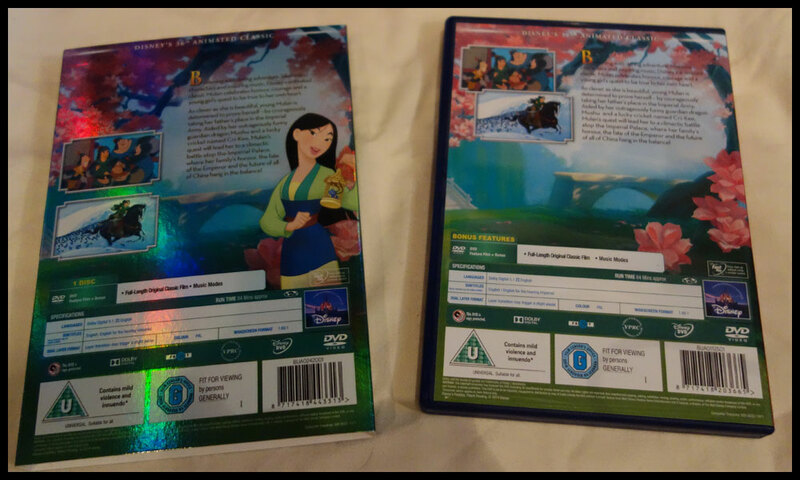 The back of the outer slip case is similar to the inner with the addition of a holographic look background and the image of Mulan off the front is repeated off to the side so the other aspects like the description and the smaller images have to be realigned. The back image is a lot calmer than the inner case’s front image but goes well with the colour chosen for outer slip cover. I prefer the spacing in the newer outer case, the middle part of the inner case seems a bit empty. 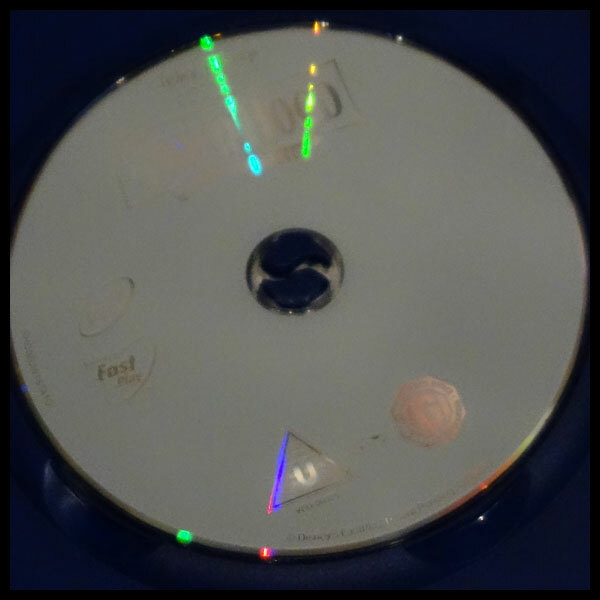 The DVD itself uses the same image as the front of the slip case. It’s a nice design but doesn’t really stand out, not that it really needs to as you’ve already bought the DVD at this point, but the fact it ties in with the box is a good idea. I was a bit disappointed by the lack of extras in this, there is just the ‘music modes’ and you can sing along to the songs, or the five featured ones chosen to have lyrics. There is also sing-a-long mode where you simply choose the individual songs or to play all in a row rather than waiting for them throughout the movie. 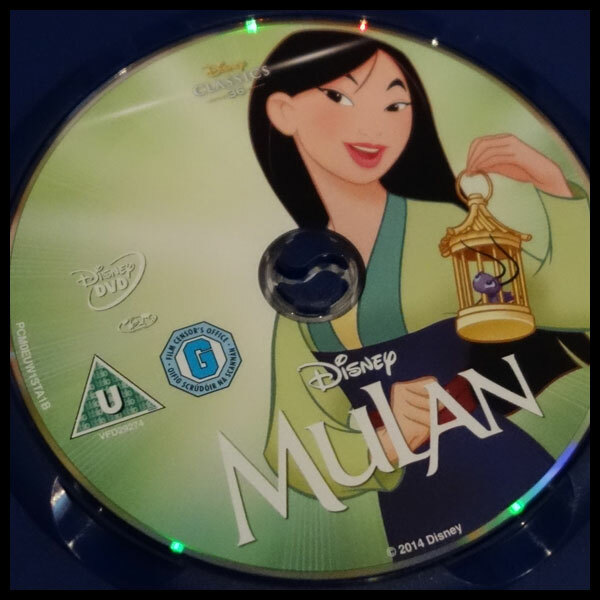 The disc menu is nice, there is the option of fast play to start the movie without the main title screen, but the menu itself has a different image of Mulan for the different menus. The Robin Hood movie was my favourite Disney movie growing up, I think I just liked the whole Robin Hood story altogether and the fact they were foxes just made it even better. It was released in 1973 so probably 20 years before I saw it but I really like the art and characters in it although I know it doesn’t seem to appear on a lot of people’s top Disney movies lists. I think it stayed pretty true to the original Robin Hood but with animals, the main points in any version of Robin Hood have been included. I really liked the character of Sir Hiss, I’m not sure why but I liked him and the cockerel version of Alan-a-Dale. 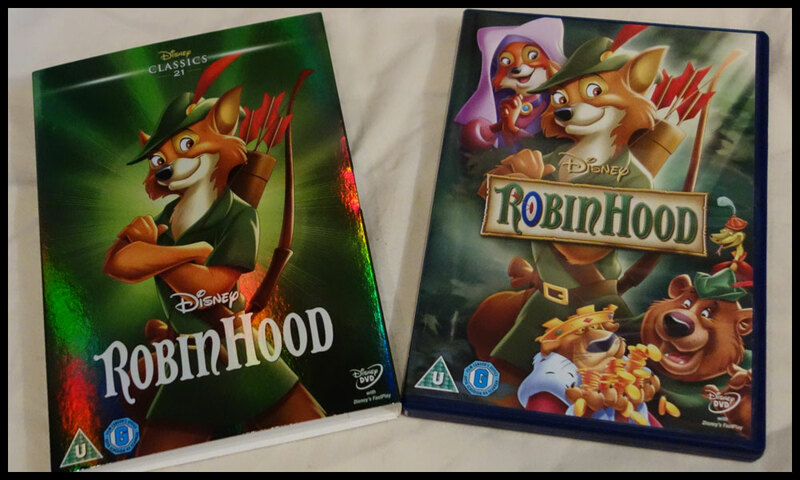 Like the Mulan DVD the outer case is holographic, this time green, with the main image of Robin Hood on it. Unlike the Mulan one this one has the main image of Robin Hood the same as the Robin Hood image on the inner case. The outer case does seem to be more vivid with brighter colours and more contrast in the shadows which makes the image stand out. I like how both of these covers have the number that they are in the 100 classics, as these are done in chronological order it helps you to see how Disney changed through time. 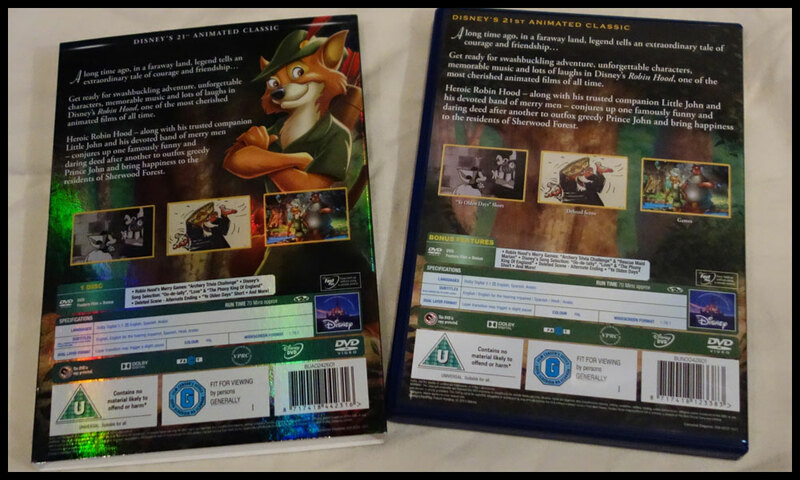 The inner case has the main Robin Hood image with some of the other main characters around it as well; Maid Marian, Little John, Prince John and Sir Hiss. Again I prefer the outer case with the holographic back, I tend to prefer the simple or minimalist looks for things like this. The inner case is very close to the outer one on the back, the main difference, again, being the addition of Robin Hood on the right and the need to move the text though this time they kept the images the same. I think the design for the back of this case is better than the Mulan one to me. One thing I noticed on the inner case is that it mentions an extra game in bonus features; ‘Rescue Maid Marian’ which isn’t on the outer case and I couldn’t find it in the DVD itself. I didn’t manage to get that far on the trivia thing though as I was only trying it out, maybe you have to unlock it, but it did sound like it might be a more interesting game than a trivia game. Archery trivia challenge – a game where you choose the right answer out of 4 options about the movie and an arrow gets fired at the target. Quite fun but a bit repetitive, would probably be more entertaining for little kids and could be a fun game for everyone to join in maybe. Song selection – like Mulan either you choose to sing along in the movie or choose the songs to sing to from the menu. Deleted scene – alternate ending that starts off with a scene from the movie and a bit of an explanation before carrying on with storyboard style sketches and voice over acting for the characters. Ye Olden Days short – black and white short animated story of Mickey, Minnie and friends. Goes well with the Robin Hood theme and nice to see early versions of some of the characters. It’s 7 minutes long so not too long. Robin Hood art gallery (as far as I can see this is the ‘and more’) – see pictures from behind the scenes, either as a sideshow or looking through them as you want. Both of these movies are rated U and are suitable for any age, I’d say both are still ones that children would like today especially as they’re Disney and I think the stories themselves are good enough to be enjoyed even if they weren’t something you saw when you were younger like with me. I think they both also have parts that an adult would like, some jokes that I get now I didn’t when I saw them years ago, so they aren’t ones that parents or adults would sit through totally bored while the kids enjoy them. If you already have the DVD versions of these then they probably aren’t worth picking up though if you don’t I would say as long as they’re a good price, they both seem to be around the £10 mark at the moment, then they’re worth checking out. The covers are definitely worth that bit extra for me though I’m not sure they would be to someone who isn’t planning on buying a few of them, I like it when a series looks similar to each other.